I am a self-taught amateur graphic designer with experience in Photoshop, InDesign, Illustrator, After Effects, and Premiere. While this started out as a hobby, it is something that helped me get involved with many organizations in the past few years. I’m currently doing design work for UBC BizTech as the Creative/Marketing Director, and took charge of the entire redesign of the club’s branding. This included creating a new logo, website, banner, and general look and feel for all future documents and social media graphics. Rather than creating a portfolio of my past design work, I thought it would be more fun to tell the story of how graphic design became an interest for me. I first taught myself Photoshop in grade six and had been making posters and random silly images throughout high school, picking up new skills from friends and online tutorials. In eleventh grade, I began taking photos for local Model United Nations conferences, and my posters were noticed by somebody planning to start his own conference: CAIMUN. Below: CAIMUN's logo, and my first "professional" photoshoot. I think the photoshoot is a story on itself, but that's for another time. I was assigned the role of “Under Secretary General of Graphic Design and Photography”, a very fluffy position title with little meaning. I expected to only be in charge of photography and simple designs such as social media promotions, as at the time I was only fluent in Photoshop. One day however, I was asked by the Secretary General of the conference to create the delegate handbook. I was unsure of my capabilities, as I had never worked on any print materials before, and had no clue how I could translate designing small graphics into designing a whole booklet. 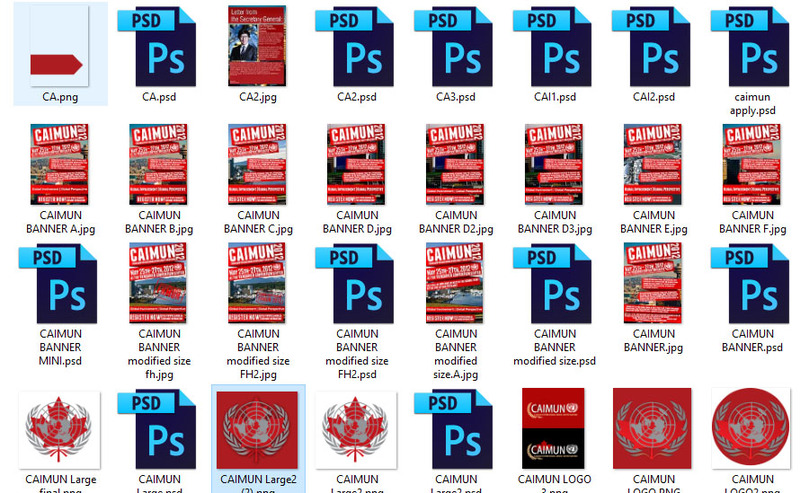 One of the first graphics I designed for CAIMUN, and its many iterations. My naming conventions have improved marginally since then. I was provided with a template that was used to design a past document however, theoretically making things easier. The issue was, I hadn’t ever seen a file extension like it at the time, “.indd”, and didn’t even have a program that could read the format. One Google search later, and I discovered InDesign. I downloaded a 30-day trial to start designing my first masterpiece from scratch: the marketing package - a precursor to the full handbook. “Masterpiece” may not have been the best word; my first attempt was shoddy and poorly thought out. I used the same principles I knew from designing simple, image-focused graphics to design a complex text-focused document, which obviously didn’t translate well. Additionally, there were many things in InDesign which were alien to me: text and image frames, hotkeys, tools, colour settings, it was almost like being transported to a foreign country. The feedback for my first attempt at a handbook was rough; most non graphic design-oriented people care don't care about the process that goes into making the products, rather only how appealing the final product looks. While it was demoralizing to spend a full day working on something that was essentially unusable, I’m not the type of person who gives up trying to learn. I spent the next day tossing out my limited knowledge of design, and researching other peoples’ existing work. I dug out magazines, advertisements, and other booklets around my house and studied them, trying to recreate certain aspects I liked and mixing other elements in. Despite a surprise deadline, I was able to complete the booklet on time, saving the conference over $3000 in printing costs. Seeing all 600 delegates at the conference with something I designed was an immensely satisfying conclusion to my struggles. While the final product is mediocre to me now, at the time, it represented just how far dedication, a sense of urgency, and curiosity could go. Prior to that event, had you asked me if I knew how to use a new piece of software, I’d say no and leave it at that. From that day on however, my answer has been “let’s find out”. This is the mentality that drove me to learn Adobe After Effects to create infographic animations for a marketing project, Illustrator to create logos, and many other different skills both design related and non-design related. Hopefully this has provided a general overview of my design process and style.